Welcome back to my blog where I share my experiences on the process of reaching my goal: To live a life I am proud of. Time flies and the personal development is moving on, and I am proud to say that I have a much better understanding of the necessary changes that need to be made for me to reach my goal. I should also say that there are many times I start thinking if it is worth the effort, but I use the saying: “When you think about quitting, look at why you wanted it from the beginning”, and I do so by looking at the reasons identified under Why in the define goal page. I listed a series of reasons and they help me going. If you have done the same thing then I do hope the reasons bring you back on track if you feel frustration for your improvement plan. Let me also share that in my experience the feeling of frustration and stress towards the tasks you do is a good thing, it means that you are working on the improvement and that things evolve so be patient. The tool I am about to present to you today is actually a tool that can really help you on your way towards your goal. 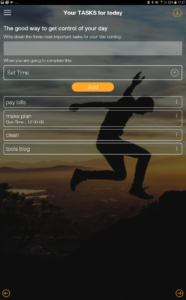 The tool is called Today’s Tasks and help you plan for the important things of the day coming. 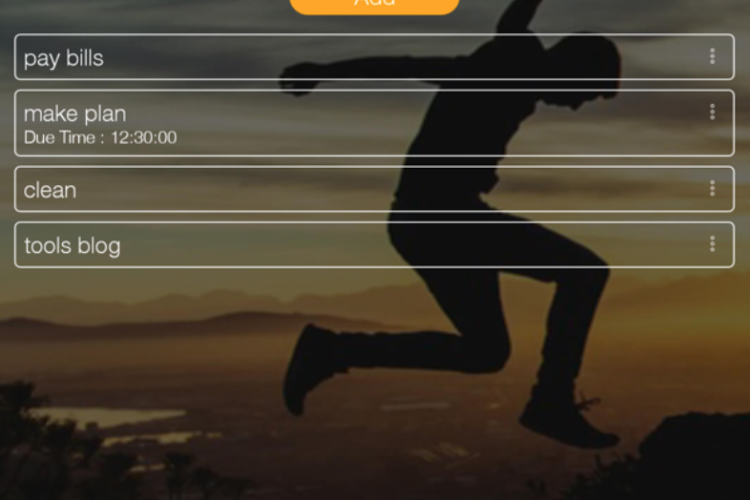 This tool was initially designed as a “mock-up” tool for fun, but it has evolved to become a very useful tool and I am sure it will have a positive effect on the user. An important reason for this is the reflection/evaluation part in the tool together with important tasks. Consciousness about the state of mind and good planning of the important tasks increases your possibility to get through the day with control and confidence. I have also learned that spending a little bit of time on this tool significantly helps me do the necessary things for the day. If you read about people who run a multinational company, are a loving present parent of four kids, all with different activities every day, they never miss a single parent team training session and on top of this have time to meet their friends and spend quality time with their family, you might probably think: How is this possible? I have an idea as to how they manage. They plan their life thoroughly, stick to the plan and they have a positive attitude to problem-solving. We believe that the today’s tasks tool can help with all this. When you wake up in the morning you should give yourself some time to think about how you feel and use three words to describe your feeling that morning. Use whichever word you find correct. If you have slept poorly you might feel “tired”, “grumpy”, and if you have had a really good night sleep you will probably feel “rested”, “energic” or “happy”. The system stores your words and presents them so that you can easily see the words you use most often. If you have a majority of negative words you should probably search for tasks you can do to get a better night sleep and thus wake up with a better mood. The next step in this tool is to plan your day. Your regular tasks are already in your head, at your work or school you have your plans on the calendar. This tool is meant to emphasize the things that are not regularly but important this day. You should find at least three, but can, of course, write down more. If needed you can set a time stamp and the system gives you an alarm. It is possible to use this tool as your complete daily planner if you want to. In the afternoon/ evening, you open the tool again for reflection of your day. We want you to use three words that describe your day. 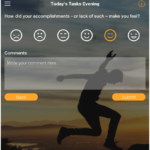 Then you look at your tasks and tick off the once completed, the system asks you to identify your feeling, which is related to the number of tasks you have completed – you do this by clicking one of the smiley faces. Everything you put in stores and you are presented with statistics to this. Over time this tool becomes a great assistant for you as it provides information about your perceived state of mind and how you go about completing the tasks you set for yourself. 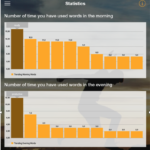 It is our strong belief that your mood is reflected in your ability to comply with the tasks you give yourself every day.The statistics show the number of times you have used your words in the morning and afternoon. 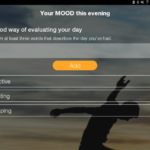 You can see the number of tasks you have completed along with your mood (smiley face) and it is even a correlation calculation for the relation of mood and completed tasks. I challenge you to try it for at least two weeks and see how it affect your mindset and efficiency. Best of luck. Do you have goals for 2018? 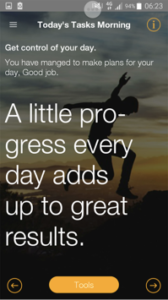 Read about setting goals.